A book I have co-edited has reached the top Springer download charts. Since its online publication on November 2014, there has been a total of 28,033 chapter downloads of the book on SpringerLink. This means that the book has been one of the top 25% most downloaded eBooks in the relevant Springer eBook Collection in 2015. 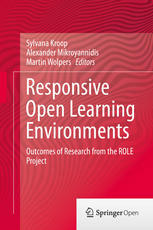 The book is entitled “Responsive Open Learning Environments” and presents the outcomes of 4 years of educational research in the EU-supported project called ROLE (Responsive Online Learning Environments). Authors of this book are researchers, developers and educators who have worked in the ROLE project and belong to the ROLE partner consortium consisting of 16 internationally renowned research institutions, including those from 6 EU countries and China. Chapters include numerous practical tutorials to guide the reader in creating innovative and useful learning widgets and present the best practices for the development of Personal Learning Environments (PLEs). Additionally, each chapter has been commented by experts outside of the ROLE consortium, who have offered their perspectives on PLEs. The book is available online as Open Access via SpringerLink.